30 Second Wine Advisor: Zin, again! Perfect Wines for Thanksgiving + $1 Shipping! Order now for on-time delivery! Plan ahead and have the perfect wines on hand to go with your holiday feast! The California Wine Club has selected six delicious handcrafted wines that will match your holiday fare beautifully. And if you order by November 1 at 5 p.m. PST, you'll get $1 shipping on every case and half case. So, speaking of Zinfandel, as we were the week before last, is Zin an American wine? Well, sure, as long as we understand "American" in terms of our immigrant heritage. In those terms, Zin is as American as anyone whose ancestors came from Croatia via Puglia in Southern Italy by way of Massachusetts to Napa; and better yet, it traveled that last lap in the hands of a 19th century Hungarian promoter!! A lot of this heritage, like the family tree of an American who got around to studying genealogy only recently, wasn't clearly understood until the past decade or so. Zinfandel was long called a "mystery grape" because it had seemed to appear from nowhere in California Gold Rush days, hyped by a promoter named Agoston Haraszthy, who claimed that he had brought the rare grape to California from his native Hungary. In fact, Haraszthy might have been the 19th century wine world's answer to P. T. Barnum. He certainly exaggerated his role in the grape's journey, to say the least. Zinfandel (sometimes rendered "Zinfindal," "Zierfandler" or "Zeinfindall" in those days) was widely known in the Eastern U.S. as a table grape long before Haraszthy ever set foot in Napa. Wine historians have found records of it on sale at a horticultural fair in Massachusetts as early as 1834. Also, based on similarity in the grape and its leaves and the wine it made, Zinfandel for many years was thought to be a sibling of the Southern Italian Primitivo of Puglia. It was only as recently as 2001 that modern grape sleuths, including Dr. Carole Meredith of the University of California at Davis, used DNA technology to confirm that Zinfandel and Primitivo are the identical grape, albeit different clones; and the same is true of the little-known Crljenik Kasteljanski of Croatia, which is now thought to be the original variety, exported to Italy as Primitivo and to the U.S. as Zinfandel. 1. Historic, classic-style California Zin, actually a rustic "field blend" of Zin with such other usual suspects as Petite Sirah, maybe Carignan and others. 2. Lighter, "claret-style" Zins with good fruit but lighter body and (relatively) low alcohol. 3. Huge, blockbuster-style Zins, ranging upward from 15 percent alcohol, typically "fruit bombs," have won high ratings. Many wine lovers can't get enough of them, but for me, they make better cocktails than food wine, it's not my favorite style of Zin. For this week's tasting, I picked up a wine that falls nicely into the first category: Folie à Deux 2011 Dry Creek Valley Sonoma County Zinfandel is fruity, even jammy, to be sure, and no shrinking violet at 14.5 percent alcohol. but it carries its high octane well and comes across balanced enough to serve well at the dinner table. You'll find my tasting notes below. Plan ahead and have the perfect wines on hand to go with your holiday feast! The traditional Thanksgiving dinner can be a tricky one for pairings. There are so many delicious flavors that your best bet is serving a variety of wines. The California Wine Club has selected six delicious handcrafted wines that will match your holiday fare beautifully. And if you order by November 1 at 5 p.m. PST, you'll get $1 shipping on every case and half case. Since 1990, The California Wine Club has done what other clubs don't: They explore the dusty back roads of California wine country and beyond, seeking out small, family-owned wineries that are handcrafting award-winning, artisan wines. They seek, taste, select and then deliver only the very best wines. Every wine is 100% guaranteed. FOOD MATCH: Zin is a reliable partner with steaks or burgers and fine with char-grilled chicken. It went very well, too, with Italian sausages sauteed with peppers and onions. WHEN TO DRINK: I don't consider Zin a candidate for long-term cellaring, but I'd have no qualms about keeping this one around for another year or two on a wine rack, perhaps a bit longer under good cellar conditions. Here's a link to the winery promo sheet on Dry Creek Valley Zinfandel, with further links to a more detailed tech sheet featuring the somewhat outdated 2009 vintage. 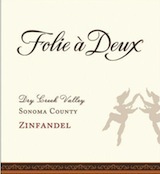 Check prices and locate vendors for Folie à Deux Dry Creek Valley Zinfandel on Wine-Searcher.com.